Bugatti gave its fans as well as gamers and petrol heads a very good reason to be excited at the 66th International Motor Show (IAA) held in Frankfurt. For this year, the French manufacturer has managed to turn what was once merely a virtual project to something tangible. Working with Polyphony Digital Inc., the French automaker will be presenting the virtual concept its newly developed Bugatti Vision Gran Turismo as an actual show car. Polyphony Digital is the creator of the successful video game Gran Turismo franchise. Bugatti has just published the first ever digital rendering of this car with a design that pays tribute to its racing history and based mainly on the newest motor sport technology. This includes the great racing tradition of the past like the ones during the 1920s and 1930s plus various victories during the Le Mans 24-hour races. The designers used the brand’s racing success during the 1920s and 1930s as the main inspiration for the Bugatti Vision Gran Turismo. In particular, the design used a historical theme through the Bugatti Type 57 Tank, considering it had won the 24-hour Le Mans race during the year 1937 and 1939. As a result, the Bugatti Vision Gran Turismo will have the same two-tone finish of the Type 57 G Tank, the car that won the 1937 Le Mans race. This same color scheme also brings to mind the colors of the French race cars during that same period. It is also the reason why Bugatti has stayed loyal to the color blue. This sports car will race in the same class as cars that generally have little or no connection to real road vehicles. The second was that each part of the car must be functional. Thus when the virtual car was eventually developed, it was done in cooperation with engineers from Bugatti and based on innovative racing technology with accurate aerodynamics. Furthermore, it is very clear that the designers have managed to transfer the most important feature of the Bugatti's design DNA into the style of this virtual race car. 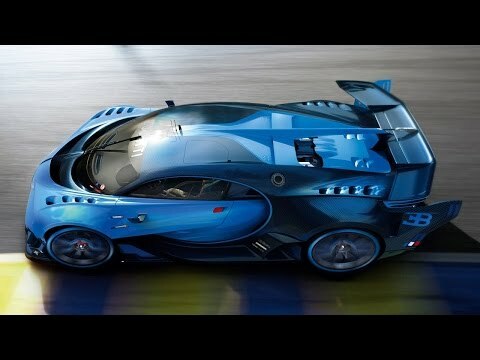 As such, when looking at the side of the Bugatti Vision Gran Turismo, one can see the famous Bugatti line. To further emphasize the brand, it has also been equipped with what is possibly the most identifiable symbol of the brand which is the horse shoe on a front grille. It has the appearance of a three-dimensional sculpture and is placed in the middle of the central front’s air intake while supporting the structure between the aerodynamic front splitter and wings. Additionally, the eight-eyed headlights flank the horse shoe and were made specifically for this model. It also has a center fin that is typical of a Bugatti. This design was based on the 1936 Type 57 Atlantic. For the Bugatti Vision Gran Turismo, the designers utilized two versions of this fin. The first one runs the entire length of the roof and contributes greatly to the dynamic stability of the car. The second version is on the front and rear wings and adds to the vehicle’s appearance. One interesting detail seen on the vehicle’s roof is its NACA air intake. Due to the contrasting light blue finish, it does not only have a beautiful shape but also gives a significant control to the aerodynamics of the top and rear of the vehicle without compromising the rear wing’s effectiveness. The vehicle also has a trailing edge that gives better longitudinal-dynamic stability and also serves as the exhaust for the hot air from its engine compartment. Also, in the video game, it informs the pursuer that a Bugatti is on the verge of getting away. Similar to the exterior design, the design team did not make any concessions with regards to the design of the interior. Etienne Salome, the head of Interior Design at Bugatti, asserts that the Bugatti Vision Gran Turismo is indeed an uncompromising race car. Thus even the interior has been designed in order meet any racing requirements. Everything on the dashboard, like the controls, display, and indicators, is placed in an area where the driver expects them to be, making them easy to reach and read. According to the designers, the goal was to develop for the fans a virtual race car that is a true Bugatti to the last detail as well as one that exudes the whole value of the brand. The designers state that they hope gamers will have fun racing it the way they had fun developing it.